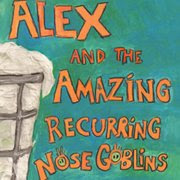 Tonight after a grueling day of graphic design and sending a catalog to the press, I am completing the last pages of my new children's book, Alex and the Amazing Recuring Nose Goblins. It was written by my colleague Richard Gerardi, and I illustrated it. I am writing about it, since it was such a major art project that has taken the past 2 years to complete and I used some collage techniques as well. The illustrations are done with acrylic paint on bristol boards. The then have china marker outlines and colored pencils added. My desire was to incorporate more collage, but this book is mostly tissue and acrylic medium. It actually has tissue, well actually toliet paper as the material thru out each page. It gives the realistic nature and texture of tissues. I added extra white paint and dark edges here and there but overall they translate very well. The style is after one of our favorite Children's book illustrators David Shannon. I also love the art work of Dave McKean and his unique story books like "The Day I Swapped my Dad for two Goldfish". I am hopeful that our new story, dedicated to single dads and the gross boy-book fans, shall take off and be sold around the world as well! So if you know a young boy between the ages of 4 and 7, who likes gross booger like stuff, we have a great story for you! If you would like a signed copy please send me an email and I'll make sure you get a copy thru my etsy store. Dedications are always a good idea too. I'm just starting the new mynosegoblins website too...I just hope my nephews enjoy it for their Christmas presents this year!